Ukraine is a foot in the door to civil war, ousted President Viktor Yanukovich said in his address from Rostov-on-Don, where he has been residing for over a month after fleeing Kiev amid protests. “Blood was spilt today,” Yankovich told journalists referring to the events in the eastern city of Slavyansk. “Now our country finds itself in a totally new situation – with one foot in the door of a civil war. 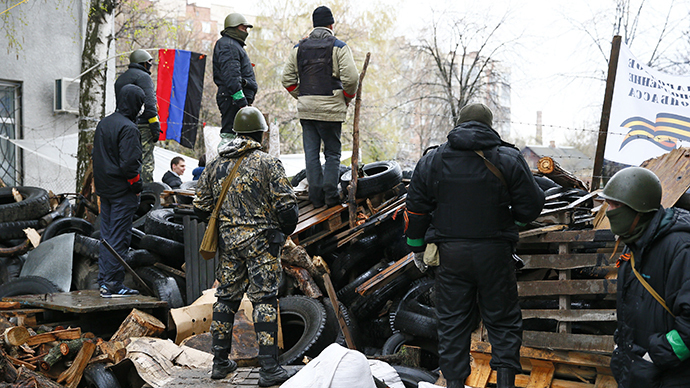 The Kiev junta has issued a criminal order to use armed forces and the army against the protesters." 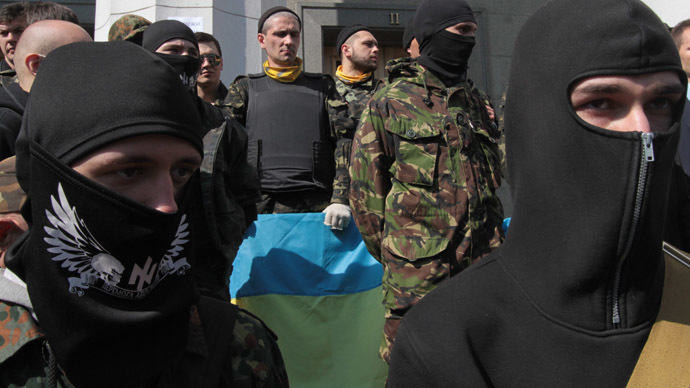 "During my time in Kiev, we never used such methods against radicals or extremists,” he added. Part of the responsibility for dragging the country into domestic war lays on the US, which brutally interfere in the situation and to point out what to do, Yanukovich said. The ousted president declared that CIA director John Brennan visited Ukraine and it was after the meeting that the coup-imposed authorities in Kiev ordered a military operation in the country’s east. Brennan “de facto sanctioned” the use of weapons and thus provoked the bloodshed, Yanukovich said. Earlier, sources told Interfax news agency that Brennan was paying a secret visit to Kiev. He has urged the country’s security forces not to obey “unlawful orders” and restrain from shooting at “people of Ukraine”. 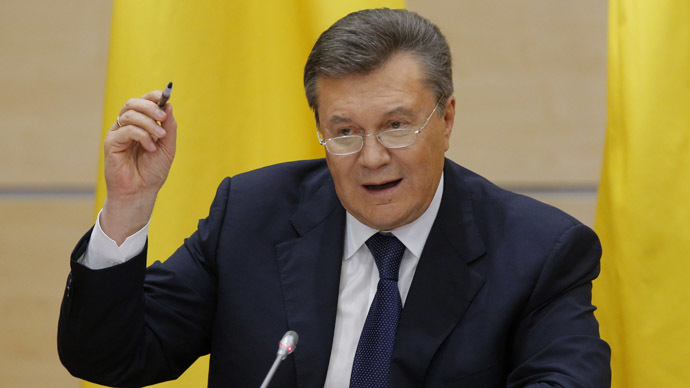 “You will never be forgiven,” Yanukovich said. 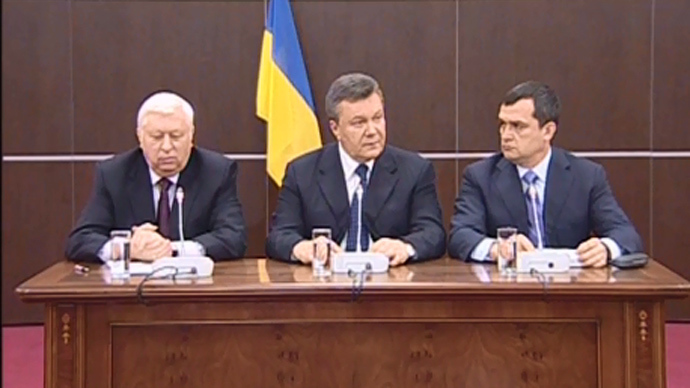 Ukraine is now “inexorably” heading towards bankruptcy and chaos, Yanukovich also warned in his speech. Holding a referendum is the only one way to avoid splitting Ukraine, the coup-deposed leader stressed. “Now there is an urgent question of the referendum, which can protect the country from split. This is the only solution," he said. First, there should be a referendum, then a new constitution and only after those steps, parliamentary elections, Yanukovich clarified. Residing in Rostov-on-Don since mid-February, Yanukovich refuses to accept his ouster, insisting that he remains the legitimate leader of Ukraine. He flew to Kiev amid the worst surge of violence in the country’s post-Soviet history. 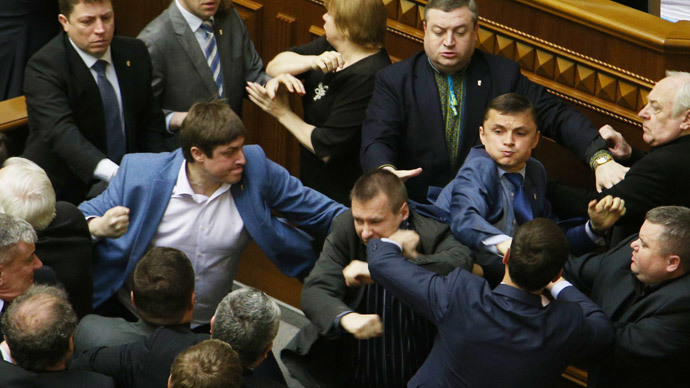 The pro-Maidan opposition immediately capitalized on his absence from the city, dominating the parliament, which then voted to strip the president of his powers and announced early elections slated for May 25.